If you are looking for Mystery, Intrigue, Laughter and Fun…we’re dying to tell you more!!! Madison missed out on her dream wedding when she eloped. Ten years later, she's determined to make everything perfect, and woe to anyone who gets in her way. Her sister and maid of honor, Ashley, flits between apathy and anger. Cliff, the best man, wallows in his own perpetual twilight. Pushed to the edge of bankruptcy, Brenda, the mother of the bride, is determined to salvage the day. Meanwhile Madeline, Brenda's best friend, envisions a Madison-free future. The perfect groom, Jake, smiles until he cries. 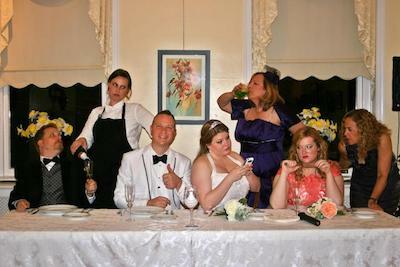 A surly waitress and some inappropriate toasts (a few provided by select audience members) finish setting the stage for a Wedding to Die For. Recommended for ages 15 & up. 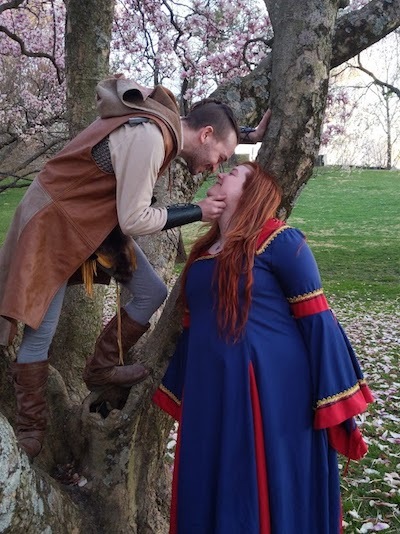 It’s the merry month of May in Camelot and murder is in the air! Old King Pellinore has been found dead beside the lake, and several legendary characters are suspects including King Arthur, Queen Guinevere, Sir Lancelot, Mordred, Morgan le Fay, and even The Lady of Lake. Was Pelly drowned, poisoned or stabbed, and by who? Dress up in Medieval attire for a chance to win a prize. Recommended for ages 15 & up. The Silvermans and Larchs are off on a grand wine tasting vacation. They start off the day at Benedictus Cellars, a respected winery, run by Natalie Benedict with her twin daughters, Kate and Bianca. Between the tastings and tours however, trouble is fermenting. Gail suspects her husband Joshua of squeezing another woman's grapes and confesses to Leslie that she's taken action to discover the truth. Leslie wonders if Gail will be able to crack the case. The arrival of an annoying wine "expert" brings the prospect of romance to Kate or Bianca, but uncorks black memories for Natalie. The possibility that the intruder might spill some swill secrets puts everyone on edge and in danger. Only the most astute spectator will have the palate to discern how it will finish. A Room With a "Clue"
Sometimes you play the game, sometimes the game plays you. From the groom to the garter, Madison planned the perfect wedding. Will someone have to die to keep it from spiraling into chaos? What is that secret ingredient in the whiskey, and who in this whiskey-making family would kill to get it? Memory is imperfect under the best of circumstances, but after a murder it can be perfect – perfect fiction. A Night Club in the 1920's is the scene of a bizarre death. Possibly an accident or more likely a murder. This awards show has everything – celebrities, gossip, greed – and a finale that the audience won't forget. Who knew reading could be so deadly? When half of the cast of Murder on the Oriental Rug bails out, the remaining performers are stuck playing all the roles. Not everyone sticks to the script. Theft, arson and murder are not the only things to worry about at an inn where paranormal is the new normal. When a winery tour goes awry, everyone discovers that even the smoothest wine can end with a deadly finish. A Taste For Murder offers interactive mystery performances for all ages. Brush up on your detective skills as you help solve the perfect crime! 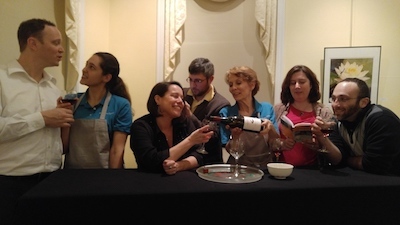 Serving Montgomery County, Maryland and surrounding areas, A Taste For Murder Productions’ repertory company of performers are drawn from the very best local and regional actors. 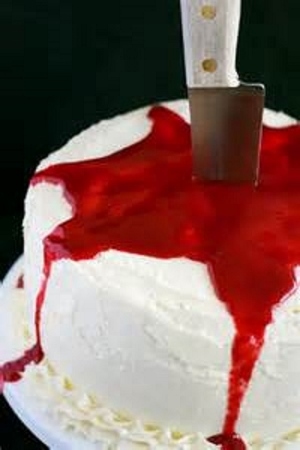 Pair our comedy “whodunit” with a dinner or simple dessert for a unique event. A variety of themes and scripts are available. To book your next mystery performance or for more information, email LWAndruski@gmail.com or call 301-605-7249. © A Taste For Murder Productions 2016-19. All rights reserved.